Every season has it’s story. Some stories are sad, some are fun. Some stories touch you while some make you wonder. Here’s a short story that involves all the four seasons. Fable: There was once a friendly competition between four sisters to judge who was prettiest amongst them. While each sister was exceptionally beautiful, they were all different from each other in nature. Winter, the eldest, was cold and harsh and everyone was afraid of her. Spring was the friendliest and the most popular amongst the four. Summer was warm, but had a mercurial temper. The fourth sister was autumn, who was very shy and generally kept to herself. Their parents, the Earth and the Sky refused to judge as all daughters were equally beautiful to them. So the daughters went to ask the Sun. The Sun thought for a while and asked them to come to him next day dressed in their finest. Winter dressed in white was impressive but the Sun could not gauge her beauty through the veil of fog. Spring looked lovely in her dress of flowers and bright green leaves and the Sun was impressed. Summer was even better in her revealing dress and seemed to be a clear favourite with the Sun. Autumn was a little hesitant to come out at first, but the other three sisters forced her. When she finally came out in front of the Sun in her amazing colours, he was so shaken up by her beauty that he fell down from his throne. The crown of gold went to Autumn, and if you happen to catch her at sunset you can see her wearing it with pride. Fact: The seasons are caused by the tilt of the Earth’s axis. Sadly, people at the equator only experience one season throughout the year. Movie: Watch this beautiful video that covers all the four seasons in just 40 seconds. Do you know of any more stories about the seasons? Send us a note if you do. Watch out for our story-telling competition with exciting prizes. Fable: At the base of Mt. Fuji in Japan was a dense forest that was home to many animals. A group of samurai warriors passing by decided to cut down the forest and make place for a training ground for martial arts. But a monk who lived in a secluded monastery nearby objected. Since the Samurai could not fight the monk, they decided on a simple competition to end the argument. The Samurai and the monk would race to the top of Mt. Fuji and the person who lost would have to leave. The samurai chose their fittest soldier and next morning both the monk and the soldier set off from the base of Mt Fuji to reach its summit. The samurai being young and energetic quickly took the lead. For a while the going was easy, but soon he found his path blocked by thick forests that cut into his flesh when he tried to pass. But the Samurai used his sword and cut his way up. He climbed hurriedly but his path was blocked by steep rocks. The samurai shed his heavy armour and sword and began to climb. He climbed for hours even though the way kept getting tougher. Soon he found himself hanging from a precipice with no way to go further. Many hours passed and by the next morning the Samurai’s strength was completely drained. He was about to let go of his hold and fall down to his death, when a hand reached out from above and pulled the Samurai up. The grateful Samurai was surprised to see that it was the monk who had saved his life. The Samurai was ashamed and he asked the monk how had he managed to climb up so fast. The monk explained that when you climb a mountain, you don’t make your own path, but you let the mountain show you the path. Moral: We need to learn to make our way around Nature, not against Nature. Amazing Fact: Mt. 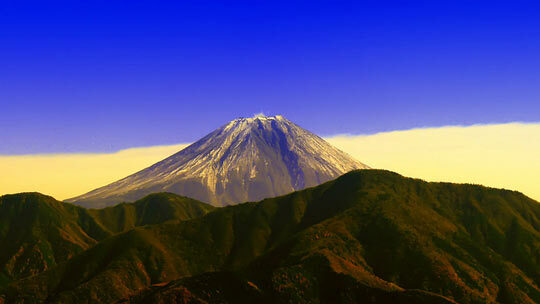 Fuji is the highest mountain of Japan. It is one of Japan’s three “Holy Mountains” along with Mount Tate and Mount Haku. On March 11, 2011 a huge tsunami hit the north eastern part of Japan, causing immense damage and taking many lives. Watch this trailer of a short documentary about how the Japanese people took inspiration from nature to rebuild their lives. Directed by Academy Award Nominated filmmaker Lucy Walker, featuring photography by Aaron Phillips and music by Moby. Discussion: A study has shown that catastrophic incidents related to nature are on the rise. A lot of the world is still debating whether this can be linked to man made activities. But this debate does nothing for the people who suffer. What can we do to be prepared for the changing times? Here’s a selection of 2 short green movies that are sure to leave you spellbound. The first one is a 2 minute video courtesy BBC ONE. It is a movie set to the tune of ‘What a wonderful world’ featuring the voice of David Attenborough. The second film is inspired by numbers, geometry and nature, and has been made by Cristóbal Vila. We hope you’ve enjoyed these green movies. Every month we will keep adding new green movies to our list. If you know of any other movies that we should add, do send us the link in the comments box below. A collection of seven stories from places some would call strange. But in our world, they are called enchanted. Enjoy this collection of strange stories from strange places and watch out for the next round of stories. 7. Strange place: Chocolate Hills, Bohol, Philippines. Fact: Spread across 50 sq. km (20 sq. miles.) there are more than 1200 similar shaped mounds covered in green grass. The hills turn brown during the dry season. Fable: There was once a giant water buffalo, as tall as a small mountain. The buffalo used to eat up all the crops in the fields of the neighbouring villages. So the villagers decided to trick it by offering it huge piles of spoilt food. The buffalo gulped the food but soon fell sick. It ran all over the place, leaving behind it’s enormous droppings. 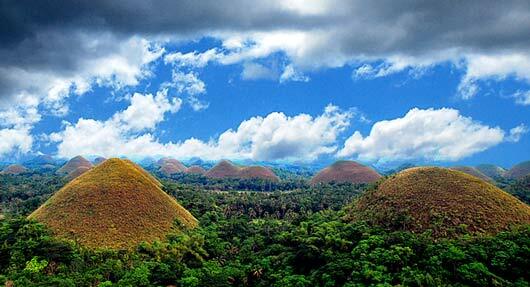 The feces dried and came to be known as the chocolate hills! Moral: Be careful when accepting a gift or favor from an enemy. 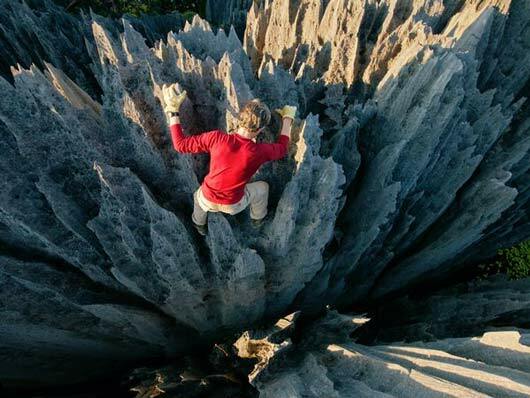 Fact: Near the western coast of Madagascar, exists a strange forest of limestone rocks shaped like giant needles. It is home to many creatures found nowhere else in the world. Fable: The Silky Sifaka was granted a special gift by the Moon god, which turned it’s silky coat moonlight white in color. The Sifakas were very proud of their good looks, but soon found out that their shiny white coat made them more visible to the cunning Fossa (A cat like hunter). Soon their numbers began to diminish alarmingly. The remaining silky sifakas took shelter in a rocky forest and asked the Moon God for help. To protect his beloved lemurs the Moon god turned the rocks into a forest of huge needles. The jagged rocks were so sharp that they could cut one in half, if one was not careful. It was a hard place to live in, but at the same time it became very difficult for the hunters to catch the silky sifakas and kept them safe. Moral: Every positive has it’s own negative, just as every negative has it’s own positive. 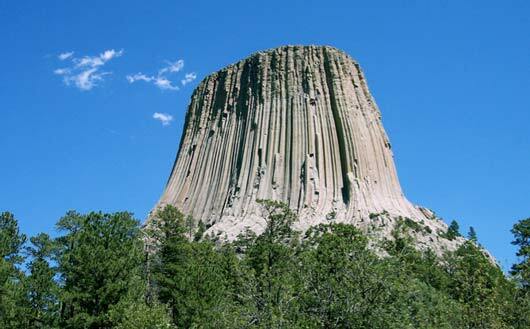 Fact: A huge tower of rock that rises suddenly from the ground and has strange markings on it’s sides. Fable: Long ago a group of seven girls went out to play in the forest. They were spotted by several giant bears, who began to chase them. The girls barely escaped by climbing a small rock. But the bears began to dig their claws into the rock and climb it. The girls prayed to the Great Spirit to save them. Hearing their prayers, the Great Spirit made the rock rise from the ground towards the heaven. The bears, began to slip down the slopes and left deep claw marks in the sides of the mountain. When the girls reached the sky, they were turned into the star constellation called the Pleiades (seven sisters). Moral: If you plan to mess with wild bears, you better have someone to answer your prayers. Fact: This island is teeming with more than 700 extremely rare species of plants and animals, a full 1/3 of which are found nowhere else on Earth. Fable: On a tiny isalnd in the Arabian sea, the Creator had built up a new world with fascinating forms of life. Of all His creations, the most magnificient was the Dragon. A strange but powerful beast that was the king of all animals. After many year when the Creator came to visit the Island, he found none of the other mammals. For the Dragon had eaten them all up. The Creator was furious and turned the dragon into a tree. 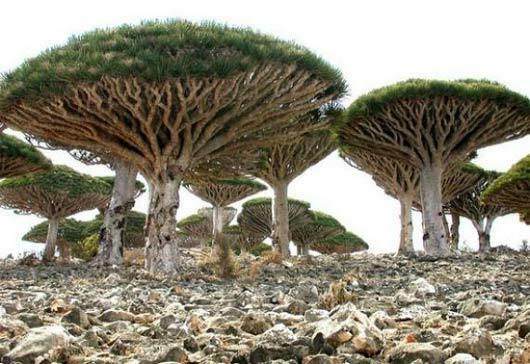 The strange tree is known as the Dragon tree. If you cut it’s bark, you’ll see the Dragon’s blood. Moral: Don’t leave a cat to guard your milk. 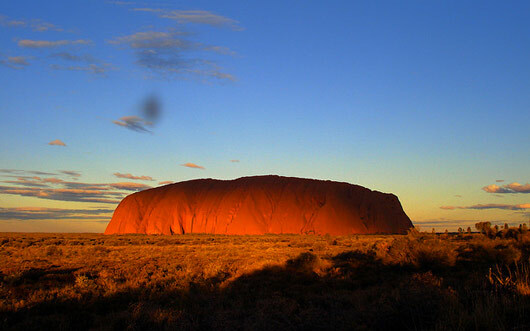 Fact: Uluru is a vast single red stone, larger than an island, that lies at Australia’s heart. Fable: The tribes were dying. The desert was a hard place to live in. The hard Sun had driven away all the clouds and dried up all the water from the lands. The tribes prayed to the Goddess of Rain, until she took pity. She told them that she would create a great lake that would be invisible to sun. And as the tribes watch a huge rock grew up in the middle of the desert. The tribes were confused. But soon realised that the Uluru’s runoff from the rain, lies deep-set in the sand at it’s base or is held in the roots of desert scrub that grow around it. In a way, the Uluru was an inverted lake. Moral: Nature has many secrets to tell, but only a few people willing to listen. 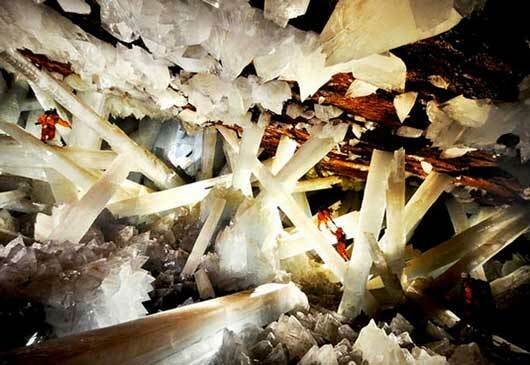 Fact: Mexico’s Cave of Crystals, contains some of the world’s largest known natural crystals—translucent beams of gypsum as long as 36 feet (11 meters). Fable: A poor farmer once saved a young girl from drowning . Now the little girl was no ordinary girl, but the daughter of a silver star. Pleased with the farmer, the Star gifted him with an immense treaure of precious crystals. The famer was overjoyed at his luck. But soon his joy turned to fear. He had never seen such wealth. He was afraid, it would get stolen or taken away from him. He asked the Satr to hide his treasure in a deep cave far from everyone’s view. Years passed, the farmer grew old, and his memory grew weak. On his dying day, he called his family to tell them something important, but could not remember what he wanted to say. 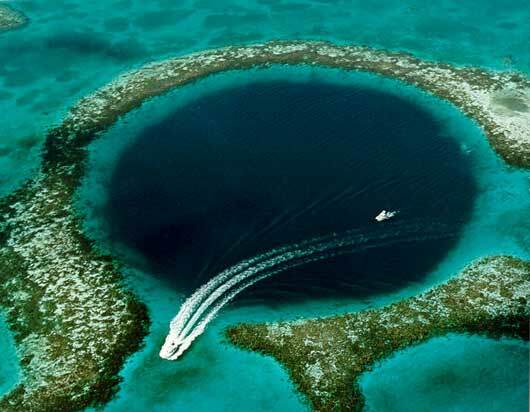 Fact: The world’s largest blue hole is a verticle cave in the sea and is one of the most amazing dive sites to explore in the world. Fable: Long back in time, when Earth was covered in ice, there was a group of sabretooth tigers who lived in a big vertical cave. The cave protected them from other enemies and had been their home for generations. One year a bunch of animals running past their cave warned them of approaching seas. But the sabretooth tiger family did not believe in rumors. They were confident of their strength and the security of their cave. The temperature was rising and more and more animals were seen rushing past the cave. The sabretooth laughed at the scared animals and ignored them. Until one day, a huge wave from the ocean came in and filled up the entire cave within a few seconds. There was no escape for the sabretooth tigers. Moral: Don’t live in a hole. Stay informed about what’s happening in the world. All fables written, or collected and retold by Nitin Das. What’s the strangest place you know of? Tell us and we’ll try to find and post it’s fable. In this short green movie, Yann Arthus-Bertrand captures some interesting facts about the forest. He was appointed by the United Nations to produce the official film for the International Year of Forests. Be amazed by the beauty of these enchanted forests through stunning visuals accompanied with narration by Edward Norton. 1. Forests cover almost one third of total land area on planet Earth. 2. Forests are the ‘lungs of the earth’. They supply us with fresh oxygen and remove CO2 from the atmosphere. 3. More than 75% of the world’s usable freshwater comes from forested areas. 4. Rather shockingly, 36 million acres of natural forest are lost each year. Which is more than the size of England! 5. More than 300 million people around the world live in forests. 6. More than 1.5 billion people depend on forests to earn a living. 7. The total global trade in forest products was valued at around $379 billion in 2005. Forests are important for our future because they help us get clean air and clean water. But at the current rate can you figure out by when all the forests of the world will disappear? It is sooner than you think. 1. Lessen the use of forest products, like wood and paper. 2. Support organizations that are trying to save our forests (LINKS). 3. Protect local forests near your area and if possible plant a few trees. 4. Raise awareness among people by sharing this information. If you have other suggestions, ideas or interesting facts about forests please put them in the comment box below. In the Stories about nature series we are presenting a collection of wonderful stories from around the world that revolve around nature. These stories show the importance and respect given to nature since time immemorial. Fable: In ancient China lived an artist whose paintings were almost life-like. The artist’s fame had made him proud and conceited. One day the emperor wanted to get his portrait done so he called all great artists to come and present their finest work, so that he could choose the best. The artist was sure he would be chosen, but when he presented his masterpiece to the emperor’s chief minister, the old man laughed. The wise old man told him to travel to the Li River, perhaps he could learn a little from the greatest artist in the world. Reduced to tears with anger and curiosity, the artist packed his bags and left to find out this mysterious master. When he asked the villagers on the banks of the river for the whereabouts of the legendary artist, they smiled and pointed down the river. The next morning he hired a boat and set out to find the illustrious painter. As the small boat moved gently along the river he was left speechless by myriad mountains being silently reflected in the water. He passed milky white waterfalls and mountains in many shades of blue. And when he saw the mists rising from the river and merging with the soft clouds surrounding the peaks, he was reduced to tears. The artist was finally humbled by the greatest artist on earth, Mother Nature. Moral: We have a lot to learn from Nature, the most important thing being humility. Amazing fact: The Li River originates in the Mao’er Mountains in Xing’an County in China. Along the 100-kilometer stretch of the Li River, there are beautiful mountain peaks. It is one of China’s most famous scenic areas, featured in many scroll paintings. WE keep adding new fables and stories about nature every fortnight. Subscribe to stay updated, share to spread the wisdom.